Late in 2014, Djingareye S picked up a needle and thread and forced herself to remember the terrible day two years earlier when a group of masked Tuareg rebels had arrived out of nowhere on camels and forced her family to leave before setting fire to the family home. Djingareye described the scene to Ousmane Toure, a visiting art student who sketched out a rough design in pencil. Djingareye then began to embroider in the details. By the time she described her design to Peace Fellow Giorgia Nicatore in this video, Djingareye was crying. But she did have the satisfaction of producing a very strong image which was her way of speaking out against the crime. Embroidery can be therapeutic for survivors of sexual violence. It also teaches a skill – sewing – that will always come in useful. 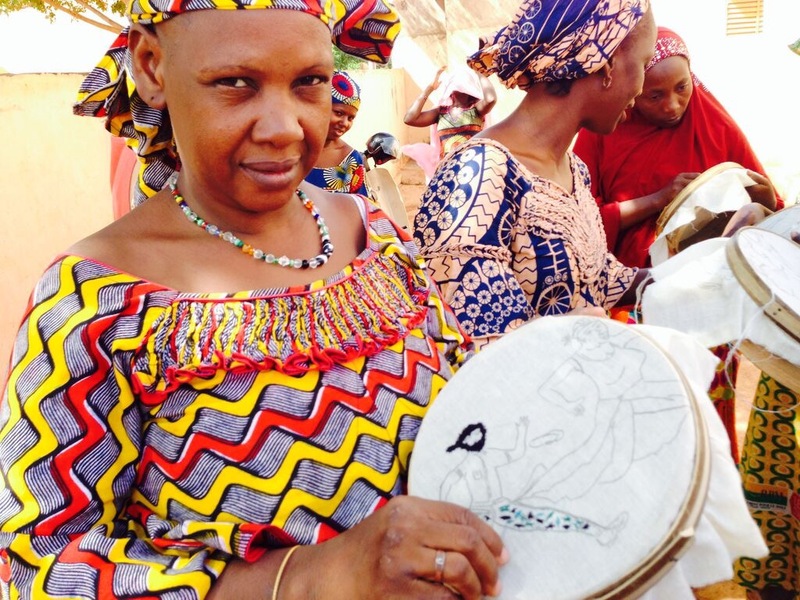 This was our hope when the campaign first offered embroidery in 2014 and recruited two experienced trainers, Massaran Traore in Bamako and Mariam Sidda Maiga in Bourem, to provide the training. After a month of basic instruction, the first beneficiaries, like Djingareye, were able to produce wonderfully expressive squares that described their lives. Furthermore, embroidery was now part of life at the centers – few beneficiaries could be seen without a needle and thread at their side. By the end of 2015, the program had created an undeniable demand for sewing and embroidery among trainees at both centers. It was time to ask: could this skill generate an income for the trainees while they are in the centers and after they leave? Money had not been a goal of the campaign up to this point. All squares produced at the centers had been taken to the US, where the best squares were assembled into advocacy quilts and shown at exhibitions as described in these pages. But in 2016 the campaign began to seek out a more direct form of benefit for the trainees. This began with the designs. The first squares described violent scenes which were undeniably powerful as advocacy but unlikely to sell. As a result, more recent embroidery has featured village life, camels and canoes and produced more gentle images. Some of these squares were also taken back to the US and assembled into two quilts around the theme of camels. AP then brought one of the camel quilts to Mali, where it was greeted with so much enthusiasm in the Bamako Center that the trainees produced their own quilt vibrant with color (photo). They received an offer from a local hotel in Bamako – and enjoyed their first sale! 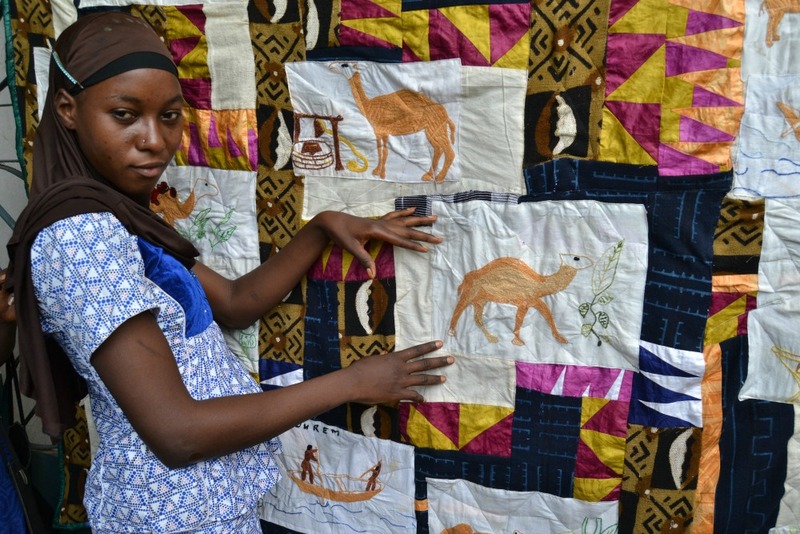 The original camel quilt is back to the US, promoting the larger campaign and raising money for the artists.